Hello. 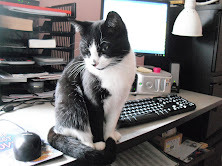 Today I have been indoors, the weather is miserable, wet, and cold. Woke up to snow, then more snow came down, big flurries. It didn't last long then a bit later it started raining, and now it has all been washed away. It's still bloomin cold though. Nothing for it but to get on with picture number three. Here is a little teaser of the work done so far. All shades of green at the moment to represent the fields. I have been searching my wardrobe for unwanted clothes, unwanted anything really. Yesterday I bought a ladies green top for £1 from the Age Uk Charity Shop. Jersey type T-shirt fabric is the best for this, it is the same colour both sides, and twists easily into cords without fraying. I'll let you into a secret, there is a pair of my pants in here ha ha, it's the greenest green field, in the middle. I have enough green fabric now, further up I shall be introducing more colours. Although the picture in the magazine is a winter scene, I think I may change it to a summer one, then I can add some flowers. Once I get the base cover done there will be a lot of embroidery and beads going on top. The size of the picture will be 18.5 inches by 24 inches, plus the frame. I have some pieces of wood which I was going to use on a previous picture, they will suit this one better. A long way to go yet. I have had an email from someone who has connections with The Rectory at Clixby. Her great grandparents were employed there, and got married, in 1901. It's amazing what this internet throws up, you never know who is reading your blog. How many goes does it take you to do a selfie? Lots, ha ha. Ooops, cut his nose off. Ooops, cut my head off. Where did that shadow come from? My nose looks a bit red. Oh sod it, smile Rocky. We went a walk round Alkborough Flats today, it's a wetlands area on the banks of the River Trent. Hoping to do a bit of bird spotting. Not many about, think they have all flown south for the winter. 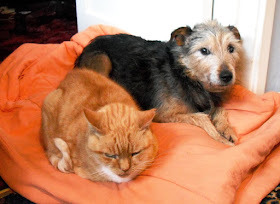 This cold weather is not very good for Rocky's arthritis at the moment, he can walk a little way, then his front leg gets a bit sore. He still wants to go out though, so the pushchair is ideal. I get a walk and exercise, he can snuggle under the blanket and feel the sun on his face. He likes the sun. We have had a bit of snow here, but not as much as other parts, thank goodness. Most of it has melted, only a bit left on the areas that don't get the sun on it. Have a nice weekend. Hello. 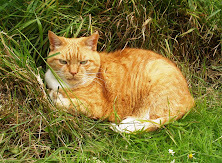 I think I should get Nellie Knowitall, our guest contributor, to write this post, it's right up her street, but as she is swanning around somewhere in the Bahamas, I won't disturb her. I am sure I am just as capable of stating the bleedin obvious, so I'll rattle it out myself. Speeding, what do you think of speed cameras, or any cameras for that matter. There is an article in a well know national newspaper this morning entitled 'Know your enemy : there are 20 different kinds of cameras spying on motorists : spot them before they spot you.' Some are used to catch criminals, monitor traffic, or collect data. But large numbers are used to issue fines, which total £284 million pounds a year. They are despised because most of the money goes to the treasury. Every time you drive you are spied on. Most of the population of Britain seems to hate them, they are labeled as 'cash cows' for the government. Ok, these are my thoughts, my simplistic way of looking at things. If you don't drive over the speed limit you will give the government nothing. If you don't park where you are not supposed to, you will give the government nothing. I have been caught speeding three times in the 45 years I have been driving, all in commercial vehicles, and all when I had a lapse of concentration for a few seconds. Not slowing down enough from 36mph when I hit a 30 limit, at 6am when there was no traffic about. Passing through a roadworks on an the A1M and didn't get down to 50mph quick enough, on a Sunday when it wasn't very busy. And coming out of a built up area on a wide road thinking the speed limit must be 40 when in fact it was still 30 for a little while longer. All my fault. My licence is clean now, and has been for some time, I have learnt my lesson. Driving over the speed limit costs money, so why would I put myself in that situation now. You can get a speed camera detector gizmo for your car, it will bleep as you approach one, they can cost around £180. Why would you want to pay that much, when all you have to do is watch for the speed limit signs, make a mental note and adjust your speed accordingly. Simple really, it costs nothing to concentrate. 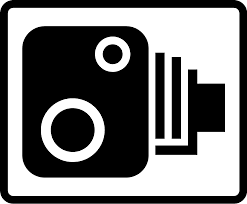 There are web sites out there which show where speed cameras are located. So, say you are planning a journey in an area you are not familiar with, would you spend time searching a map to find where all the cameras are? What if you decided to go off route during your journey and you didn't have the correct map, you are stuffed then, unless of course you have access to the maps in a sat nav. Jeez, there are enough distractions on the road without introducing more. For safety's sake you are supposed to be watching the road ahead, not eyes up in the sky searching for cameras. Wouldn't it be a lot easier to take note of the speed limit signs, then glance at your speedometer and make sure it is reading the same or less than the speed indicated on the sign. What could be chuffin easier than that! Then there are web sites which tell you how to avoid paying fines, for goodness sake, you got caught, you pay. Don't speed, you won't get a fine. Simple. A lot of the comments on the article are from people who object to Big Brother watching them, and I can't understand that. If you are doing something you shouldn't be, or if you are somewhere where you shouldn't be, then you have cause to be worried. Security cameras and speed cameras can work in your favour if you have nothing to hide. My car is street legal, no worries there. I don't mind the cameras in the High Street, I would rather someone be watching out for my safety. I don't mind cameras inside shops, useful tool to deter thieves. When I retired the pressure came off to drive anywhere fast. I did take some risks, that was the nature of the job, but now I can go about my business in a more leisurely way. I have forgotten how to rush, everything I do is at my own pace. And it's lovely, I have time to smile at the cameras. Hello. I've had a smashing day out with my walking buddies, Paul and Paul. It was my turn to drive, pick the route, and lead the walk, and I chose a ten mile walk starting at Nettleton near Caistor in the Lincolnshire Wolds. I have done this one before, and wanted to make a return visit to the Old Rectory at Claxby. Just as we were getting ready this morning it all went black and the rain was blowing sideways. It didn't look too promising so I texted Paul, and rang the other Paul, should we give it a go or would it be best to abandon the idea. We decided to go for it. We parked at Nettleton at about 10.50am and set off down the Viking Way. The path passes a farm gate and this notice caught our eye, and gave us a chuckle. The path follows Nettleton Beck for a mile or two, It goes past the old chalk quarry, and crosses a wide track. Several 4x4 vehicles were parked there, and men with guns and dogs were setting off to go and blast some poor defenceless pheasants out of the sky. The beaters were behind the trees down there, where we have just walked past. We arrived in Normanby le Wold to find the church door unlocked so we could sit inside and eat our lunch. It was a bit too gloomy for me, and I found a bench against the wall in the sunshine. It was nice and sheltered from the wind. It was a short walk to Claxby, and we made straight for the church where the Old Rectory is behind it. And here it is. If you have been reading my blog for a long time, you will remember I did a post about this building, it was abandoned left to be swallowed up by the creeping ivy and overgrown bushes. I am sad to say, it is still in the same condition, one year and five months later. Such a beautiful building, such a shame. If you want to read the post from the 12th of August 2013, it's here. You will see that someone who was a gardener there a long time ago read it and put a comment on it. It really does need someone to come along and look after it. We headed north out of Claxby on Pelham Road, and took a path along the bottom of the hill back to Nettleton, joining the main A46 for the last half mile. Mostly it was along the edges of fields, which were very muddy in places. Paul, the one on the left, likes to go wading straight through the mud whereas I like to try and skirt round it a bit. When you put your foot down you don't know how far you are going to sink into it. We were well wrapped up against the wind, and got back to the car at 3.50pm. An exhilarating ten mile walk, I shall sleep well tonight. Thank you for visiting my world, and thank you for your comments. Catch you tomorrow. Hello. Someone very kindly compared my posts to self help books. Wow! I am chuffed that what I consider as my simple way of looking at things, is making some sense with some readers. I don't profess to be an expert in anything, except lorry driving, ha ha, but I like to think that my experiences at the University of Life have given me the grounding that I need to live a contented and fulfilling life. I have always liked writing, gathering together the thoughts in my head, and putting them down in some sort of order. I wasn't very bright at school, I couldn't be bothered, just about scraped through, and hoped no one noticed that I wasn't taking it all in. I was hopeless at exams and couldn't wait to leave and went at the first opportunity. So for someone to say that a post has more wisdom that ten self help books, makes me very chuffed indeed. I am sure that many of my readers have a wisdom far beyond my own offerings, going by the comments coming in. I love the little sayings and words of wisdom that you come up with from time to time, I write them down because they trigger more thoughts and ideas which I want to hang on to. You inspire me to explore issues further, to hopefully gain a better understanding of how things fit together. Something that N said, struck a chord, 'I always make time for things that allow my creativity.' She was talking about learning new hobbies to distract herself from events she would rather forget about. It got me thinking about how creativity can play a key roll in how we can deal with putting the not so perfect past behind us. The way I see it, if someone has no creative instincts at all, they mostly rely on learning from others, they see how their friends, family, and work colleagues do things, and they follow suit. This takes less effort than thinking up new ideas. It's like going down a long straight road, and ignoring all the roads off it in favour of keep going mile after mile in the same direction, with possibly no end in sight. Changing direction would require a new way of thinking. I don't know anything about how a brain works, but I reckon that if you only stuck with the road you know, always doing the same thing in the same way, then you are only using half your brain. It's a bit of a waste, not using it to it's full potential. If you are not creative, how are you going to find your way through the ups and downs of life? Relying on others to show you the way will not work, you need to be creative in thinking up new ideas, and new directions. So, back to distraction, N could have done nothing, and gone nowhere, but she made an effort, she recognized that by allowing herself to be creative, she could move on. Creativity means going in a different direction, give yourself a good talking to, to push yourself into something outside your comfort zone. It could be something quite simple, like bake a cake if you have never made one before. Or sign up for a pottery class at college. Or taking up flower arranging. The end product of creativity is learning new skills and expanding your outlook on life. It's looking at situations from a new angle, and finding a better way to get where you want to be. Surely that's got to be a good thing. Well that's how I see it. Jayne asked for a recipe for garlic mushrooms. My easy way of making them. Mushrooms cut up if big, but small ones can be left whole. Cooked in a small pan in a splash of oil or a blob of butter/marg or both. If a bit dry add a splash of lemon juice, I have a bottle in my fridge. Or you can add a drop of water, or any old juice you happen to have around. I like them quite garlicky so I add a flat teaspoon of garlic powder, or you can use garlic paste. If you don't like a strong garlic taste you can reduce the amount or leave it out. Stir it in while the pan is still on the heat. Then I add some garlic flavour soft cheese spread. two teaspoons should do it. This costs about 45p -55p depending where you buy it. I always have some of this in the fridge because I like it on cream crackers. Take it off the heat, stir it in, if there isn't enough sauce add a spoonful of plain yogurt. If you want it rich and creamy add a bit of grated cheese. Easypeasy. Helen asked how many meals do I have a day, and what are they composed of. Thank you Helen for that question. I have three meals, breakfast, lunch, and dinner. Breakfast is either porridge or bran flakes. Sometimes with a banana and/or sultanas. I aim to have lunch any time between 12am and 2pm, depending what I am doing, and depending when my stomach is telling me to eat. Early lunch if I am feeling hungry, or a mid morning snack of a banana or yogurt if I am busy and not eating till 1pm. I like to have eggs three or four times a week for lunch, either scrambled, omelette, or boiled. Sometimes on toast, or with mushrooms, or with beans or spaghetti. I will have a salad if I have any in. Lunch could also be noodles, pasta, or cous cous. Dinner is mainly steamed fresh veg. If I run out I will substitute frozen veg, I have stopped buying tinned veg, frozen is more cost effective. I make soups, stews, and curries with whatever I have in. I like cheese grated on some of my meals. I don't have puddings because my meals fill me up. If I fancy something sweet, which could be at anytime not necessarily after a meal, I will have half a tin of rice pudding, or some tinned peaches with yogurt. I also put ground almonds into my yogurt to eat with fruit or on it's own. I don't eat much bread, but if I do it's wholemeal or seeded. I might have a cheese sandwich for lunch, or a piece of bread with lemon curd on it. I eat brown rice and wholemeal pasta. When I go shopping for food I never take a list, I know in my head the main things I need. I always have in onions, bananas, cheese, yogurt, eggs, soya milk, bran flakes and porridge. I choose my fruit and veg by whatever I can get on a yellow sticker, if not much is available I try and buy in season, and look for the best prices. If swede is cheaper than potatoes then I have swede. If carrots are cheap I get some. I like to get broccoli, cauliflower, and sprouts, but if they are too expensive I will pass them by. If you go to the food gallery link at the top of the page, there are lots of pictures of my meals there. I made some more peanut butter today, but instead of using the food processor I used the stick blender, to cut down on the washing up. I used a packet of ordinary salted peanuts and shook them around in a tea towel to get rid of some of the salt. The blender struggled a bit at first until they broke down a bit. Nothing added, just peanuts. I will keep this in the fridge and dip into it when I want some, won't bother transferring it to a smaller container, saves on washing up. I've been looking for cheap peanuts, but the human kind are more expensive than those you buy for the birds. I read the label on a packet of those, it says not for human consumption. Don't know why, they look like any other peanut. Must be different varieties. I picket up this packet of maize cous cous when I was last in Tesco, reduced from £2 to 40p. A bargain I thought. Not had it before, don't know what it's like, worth a try. And here's the dinner I made tonight. The cous cous is buried in the middle of iceberg lettuce, grated carrot, chopped celery, and cooked beetroot out of a sealed packet, (not jar). The cous cous wasn't that nice, not like the regular stuff, no taste and gritty. I didn't eat it all, got fed up with all the chewing, so I will put it back in the pan tomorrow and cook it up some more with a little oil and garlic, maybe some cheese. I've just realized, it's all food tonight, how boring, ha ha. There was something else to write about but I've run out of time, so I'll hold that over till tomorrow. I want to catch up with Last Tango now, so I'll say, Toodle pip. PS. A bag is in the post for Aussie Cheryl, thanks for sending your address. One left for Primroses Attic. I'll hang on a bit longer, but if you don't respond soon, I'll draw another name out. Hello, it's a nice day and I have been out . I went out yesterday as well, to visit The Ropewalk Gallery in Barton on Humber. I haven't been for ages so decided to take a look at the exhibitions. I was lucky, there were two extremely talented artists on show, this one was very pleasing to the eye. This is my kind of art, the sort that makes me go 'wow',, innit fabulous. The pictures here are photographed from the leaflet I brought home, there is a bit of blurb about Clive Redshaw below. Here is a link to the Ropewalk web site. There are some more of his pictures on the Lincolnshire Open Studios web site. I really enjoyed this exhibition. On a completely different note, I've been getting fed up of clearing away bread crumbs and other bits of chopped and grated food from my worktop. Some of it inevitably ends up on the floor as I try and wipe it up with a dishcloth, which then means I have to clean the floor as well. Grrrr, I hate housework. I've come up with an idea which I am trying out. I don't want to get a bigger chopping board, mine is a normal size one which can be a bit cumbersome to scrub down in the washing up bowl. I thought of an idea to extend the boundaries of the board by placing a tea towel underneath it, then all it needs is for the chopping board to be lifted on it's side, with the bits falling into the tea towel, which is then taken outside and shaken. I haven't got a nice tea towel, mine are all a bit worn, so I have used a pillow case. I will see how it goes, good idea eh! What do you do with half a portion of chips left over from the day before. I just fancied some yesterday, it was a massive portion, enough for three people. Today I put the last of them in a bowl, topped it with half a tin of baked beans, and zapped it in the microwave. Ta da! a two minute Sunday lunch, no food wasted here. I will make something a bit more healthy for my main dinner in an hour or so. I'm going to sign off now, I've got more stuff to talk about but I'll save it till tomorrow. Some questions to answer, and I've picked out a couple of ideas for blog posts from your comments. Thank you for joining in, and welcome to the new readers. PS. Still waiting for two addresses. Primroses Attic and Aussie Cheryl. You have each won a shopping bag, they are ready to go. Give me an address. Good morning, here we are it's the weekend again and I am listening to Sounds of the Sixties on Radio 2. It's sunny outside, so maybe a good day to go out. Sixties music always makes me feel happy, a little bit of jigging and dancing, ha ha. A question arrived in a comment, which I will answer now. Another question for you ( maybe you've written about it before, I'll check). You have such a great outlook, but even those with a cheery disposition have an occasional glum day. How do you lift yourself up, if one decides to come your way? 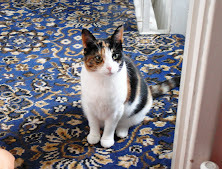 Hello bloggerette, and thanks for the question. I'm trying to think of the last time I had a glum day, there's not much that upsets me. There was a situation that was making me anxious and glum and sad all at the same time. It lasted a period of about two years, and I had little control over what was happening. Things have now been resolved and I am back to happy. I can't talk about the circumstances, but it was the actions of other people which was making me glum. All will be revealed when the time is right. Sorry if that sounds like a riddle. How did I deal with it? I learnt how to switch on and off. I got on with my life, keeping busy, distraction is a great way to blot out things. Siting around procrastinating is not going to resolve matters. All it does is make a little niggle into a great big festering hole. I cannot change how other people behave but I can change how I deal with it. I believe that all things will pass, they can hang around forever if you let them, or you can give them an almighty shove and move on. Now before anyone wants to shoot me down and say what about all the people with depression and suchlike, I am talking about how I deal with things. I know nothing about mental illness. I am really struggling to think about one reason why I should be glum, there is one niggle that comes to mind. I am getting older, and my time on this earth is limited :o( it's not fair, I have so much I want to do, but there's nothing I can do about that, so best to get on and make the most of the time I have left. My life is precious to me, I have to make it the best I can. Over the years I have learnt to build a wall of protection around myself to limit what gets through, I decide what I will allow in. I find that glumness rarely visits now, what have I got to be glum about, practically nothing. I have good health, live in a nice place, and have nice friends. I don't believe in worrying over small piffling little things that are not important. I sort things out in order of how much it will affect my quality of life. I put my thoughts in boxes, file them away if they are important enough to keep, jettison them into oblivion if they are not worthy of the space in my brain. I take things in my stride, if things go wrong I deal with it, or ignore it, depending on how it will affect me long term. Things and stuff are just that, possessions are things we collect as we pass through this life. We don't own them we just borrow them. These would come into my category of piffling little things that are not important. The way I communicate with other living beings is a completely different kettle of fish for me. My quality of life would be severely inhibited if I did not treat people in the same way as I expect to be treated myself. Saying that, it pains me to think that someone can be nasty towards me, when I don't understand why. But then I go back to the thought that I can't change how someone behaves, but I can change how I deal with it. Hope that makes sense. Hope that explains it a bit, or has it baffled you. Bet you wished you'd never asked, ha ha. Enjoy your Saturday. PS. I am still missing two addresses. Primroses Attic, and Aussie Cheryl, your bags are ready to be posted to you. 'Ello 'ello 'ello, what's all this 'ere then? Food, that's what. A quick rundown of my meals over the last few days. I don't count calories, or add up points, or weigh portions, luckily I like the healthy stuff. I do have a bit of naughty stuff, but I limit myself. Naughty food is for now and again, not every day. Regular food for me is porridge, bran flakes, fruit juices, veg, salad, fruit, pulses, nuts, pasta, rice, cous cous, noodles, some dairy, cheese and yogurt. I bought a pack of fresh tagliatelle for around £1, I split this into three meals. Garlic mushrooms with grated cheese, love this. Salad - grated carrot, iceberg lettuce, spinach, grated cheese, and chopped celery. A tasty stew made with carrots, celeriac, runner beans, and a tin of tomatoes. Just eaten a bowl of this with a chunk of wholemeal bread, one large pan makes four portions. Mostly I eat it over two or three days, sometimes I freeze it in margarine tubs. Lunch today was a happy salad. same as above, with boiled eggs. Twas a nice day to take a walk in the park, a bit chilly but ok if you are wrapped up. As I walk around our village I see a lot of people just out for a walk. Some of them walk the mile to the park, then around it, and back again. I drive there, because Rocky can't walk that far. He loves it snuffling away in the grass, then his head comes up and he has a dead leaf stuck to his whiskers, it makes me laugh. Sometimes he spots a squirrel and makes a half hearted attempt to catch it, then stands at the bottom of a tree looking up, watching the squirrel make his escape. The ducks all came across the pond to see us, hoping for some food. I always feel guilty not having anything for them. There is a notice up saying only feed them with grain bought from the shop, I haven't seen anyone throw bread in for them. Here's an idea of what to do with an old suitcase. Two pets, both want a bed near the fire. I had an old wooden drawer here but it was a bit cumbersome, took up too much space. This is a much better arrangement. The favourite is the side where Mayze is, so if Rocky is first in he takes it. They swap about and will lie in either side. Good idea I thought. And now for a surprise, I like surprises, don't you. I was asked what I do with the bags I make, answer, I give them away. Up to 9pm tonight, 417 people viewed yesterdays post, and 17 people commented. I have had a draw and four people have each won a bag. So, please send me your postal address and I will send you one. You can send it in a comment, which I won't publish, or you can email me, address on the side. I like doing secret giveaways. A lot more fun than loads of people trying to win something. Hello. I like to alternate between hand sewing and machine sewing so I don't get too bored. Today it was the turn of the machine, I fancied making some shopping bags. The fabric I have used all came from the Scrapstore, it has a backing on it so it's super thick and strong. I am trying to reduce the size of my stash, and use up some bits. There isn't enough of one colour to make a single bag, so I have mixed them up a bit. Previously I have made bags out of both these colours, there is just enough fabric left to make this last one. The handles on three of the bags are sewn onto the outside, because they were too thick to fold and tuck under the hem round the top. The other side of this bag is the opposite way round, the patterned fabric panel is in the centre. The red fabric came in strips, so I extended the width by adding a panel in the centre. The bag is blue, the handles are dusky pink, so what, they don't have to match. Super strong bags, nice and cheerful to brighten up any shopping trip, and they will last a long long time. I'm very pleased with them. Now, what shall I make tomorrow, maybe some more hand stitching on the picture. Hello and Good Evening. Anyone who finds themselves in financial difficulties and are struggling to make ends meet must be totally confused as to where to get help. The MSE forum has a section called Debt Free Wannabe, a good place to start where help and support is offered from those in similar situations. Sadly though, there are an increasing amount of people who sign up with the first commercial debt management company they come across, then find that not all of their monthly payments are going towards reducing their debt. The company is keeping a large amount to pay for their services. I've had an email from Paul Farnsworth who is running a campaign at Derbyshire Districts Citizens Advice Bureau, to promote free debt management services. I think most people know that the CAB offer a free advice service, but not many know that they can sort out the whole Debt Management Plan for you, and it won't cost you a penny. Paul is keen to promote the CAB Fee Free campaign, and wants to get the message across that you NEVER have to pay for debt help. People can visit their blog here for more information on spreading the word. Derby District CAB is also on Twitter, you don't have to sign up to read it. The National CAB website is also a good place to find out where your nearest office is. So if you are needing help don't fall for all the advertising hype you see from commercial companies, about helping you to get rid of your debt, they will charge you. Get free advice from the CAB. While on the subject, read up on what Martin Lewis says about tackling your debt problem. There you will find lots of useful stuff to help you get started towards debt freedom. There are other free charities which can help you to set up a plan. So much free advice out there, never pay for help with sorting your debts out. Do not sign up with a commercial company, I can't emphasize that enough. Thank you for the email, Paul, I hope I have got that message across loud and clear, best of luck with your campaign. Thanks for popping in. Catch you tomorrow. Toodle pip. Hello, Here is a blast from the past, does anyone remember The Tiller Girls? I remember them from Sunday Night at the London Palladium, mum would let us watch it, then it was straight off to bed afterwards, school in the morning. I thought they were marvelous, and would often copy them doing the high kicks, I could never keep up though without losing my balance. I could see myself on the stage, but the nearest I ever got to a dancing career was three months with Mavis and the Silver Stars, but had to give up because mum couldn't afford the lessons, the shoes, and costumes. I digress. 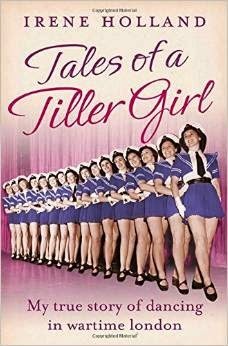 I've just finished reading a smashing book written by Irene Holland, who started life as Irene Bott, but she was asked to change it when she became a Tiller Girl. She chose to dance under the name of Irene Starr. Her book, Tales of a Tiller Girl, is an amazing account of her early life in London, through to the the present day. She was born in 1930 near Wandsworth Commomn, but sadly her father died when she was two years old, so she grew up with her brother and mother. Dancing was always her passion from an early age, and her mother who was a musician went off touring with a band just so she could afford to send Irene to Italia Conti stage school. In three years she was trained in all types of dancing and singing. Things didn't always go smoothly though, her height she wasn't tall enough for the Blueball Girls, she sustained back injuries, and the war got in the way, but at the age of eighteen she was accepted into the world famous high kick dancing troupe, the Tiller Girls. Irene has so many incredible stories to tell, from the stars she performed with at the Palladium, Frank Sinatra, Bob Hope, and Danny Kaye, to entertaining the soldiers and becoming their pin up. The book is also an interesting insight into war torn Britain, and how it affected ordinary working people. Irene is now 84 and lives in Devon. I've found this short biography about her, if you are going to read the book you might not want to read this, as it gives away the ending of her story. I must say, from a tough start in war torn London, her story has a wonderful heartwarming ending. I have found this ITV news report from July 2014, about her returning to The London Palladium. There is a short video to click on. All that dancing must have been good for her, she certainly doesn't look 84. Give this book a try if you like autobiographies, it's an easy read, and entertaining. Welcome to the new readers, I hope you enjoy your visits. We've had snow here, and I hear there's going to be more, so I won't be going far. Keep snug, wrap up, and watch tele. So many Great places to visit in Britain. Hello. So many places to see and not enough time, the UK really does have a lot to offer. Here are a few more of Julia's Wonders of Britain. Pictures from the relevant web sites, and Wikipedia. St Pauls Cathedral, London. There has been a Cathedral here for 1,400 years, built and rebuilt five times. 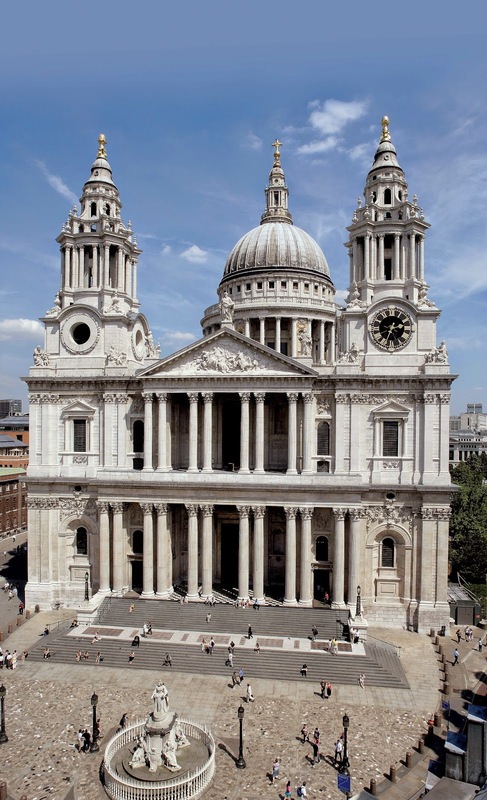 The present cathedral is the masterpiece of Britains most famous architect, Sir Christopher Wren. It's world famous dome is an iconic feature of the London Skyline. I have been here, but didn't go inside, must do that next time. Manchester Town Hall is on Julia's list. It was five years ago when I was in Manchester for the day and went to see it. I can say it is a fabulous building, if you are there go inside and have a look round. It was designed by Architect Alfred Waterhouse and was completed in 1877. The Town Hall is open Monday to Saturday, check on the web site which rooms are available for viewing. Free entrance. Julia chose The Watercress Line as her favourite steam train destination. The Mid Hants Railway runs between New Alresford and Alton. I love steam trains and was lucky enough to get a ride on one here when my friend Carol who lives in Hampshire, took me for a visit. There are many special events planned for 2015, check the web site for details. 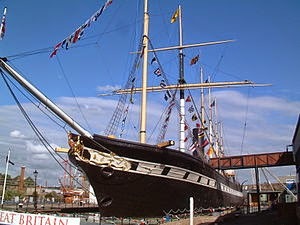 SS Great Britain is a museum ship and former passenger steamship, built in Bristol. She was the first steamer to cross the Atlantic between Bristol and New York, which she did in 1845 in a time of 14 days. She was designed by Brunel for the Great Western Steamship Company. Oh my, does she look magnificent or what. This has to go on my list, I need to go to Bristol. The picture and additional information can be found on Wikipedia. I went to visit the National Coal Mining Museum near Wakefield, and can report that it is fantastic place to visit. You can read about my trip here. Julia also enjoyed it, taking the same underground trip as I did. It really brings it home to you just how hard the work of a miner was at the coal face. Entrance to this site is free, there is a small charge to go down to the coal face.. Here is the web site. 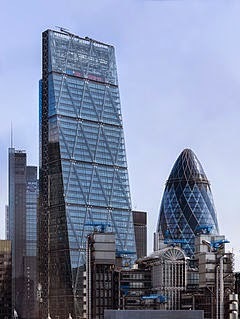 Julia also visited The Leadenhall Building, a new skyscraper in the centre of London, which has been nicknamed The Cheesegrater. It looks a fascinating place, I've been reading up about it. I haven't any plans to revisit London any time soon, but if you are there, maybe this is a good place to visit. The picture and more information can be found at Wikipedia. These are some of the places that Julia Bradbury visited on her Wonders of Britain tour, I am sure that there are many more that would be worthy of inclusion. Hope you have enjoyed this small selection. Blimey, I've got a lot of travelling to do before I die, I need to get a move on. Are you going travelling this year? Tell me where. Toodle pip.